This grade 1-6 supplemental program provides grade specific science content with “how-to” instruction and opportunities for reinforcing investigating, reading, thinking, writing, research, chart, graph, and math skills. 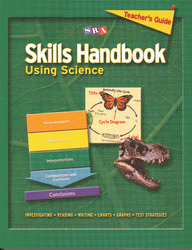 The Skills Handbook Using Science utilizes science content to teach valuable cross-curricular skills in a step-by-step format that won’t interfere with your core curriculum. In each of the grade levels, students explore lessons that are designed to bring science content and applications into a variety of subjects, including math, writing, and language arts. Self-contained lessons and a simplistic instructional design permits students to work independently, and each book includes test-taking strategies that help students develop techniques for analyzing and answering test questions.